In the master bath high-grade plywood with exposed edges forms the cantilevered shelves and the countertop. How to provide privacy while maximizing space and flow was the problem tackled in the design of this master bath. The light and airy solution, which contrasts icy blue glass mosaic tiles with warm wood, met the family’s needs beautifully. The large Lumasite- paneled pocket door is the key: it takes up less space than a conventional swinging door, and when it’s open, the bathroom and the adjacent corridor to the master bedroom flow together, making the master suite seem more spacious. When closed, the door provides visual privacy, but its translucent panel helps keep an open feel. Within the bathroom, the cantilevered shelving defines the shower area without walling it off from the vanity. This allows light from both the window and the skylight to fill the space. Plenty of storage is provided beneath the vanity, and small niches for bath essentials are built into the shower wall to eliminate the need for caddies. 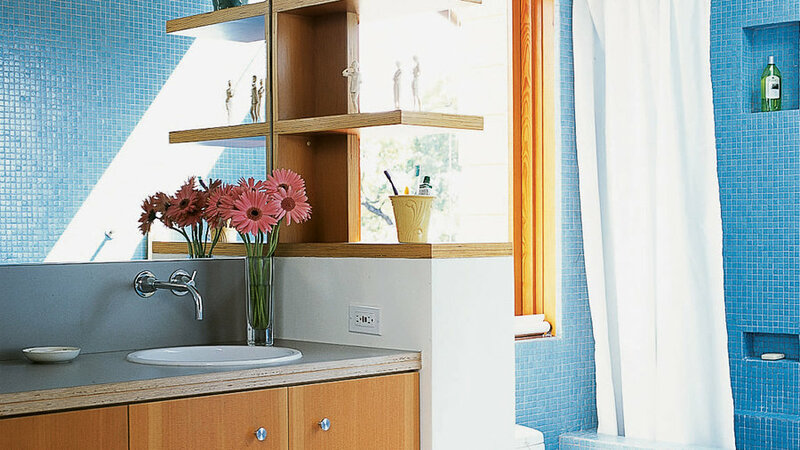 The result is a calm, uncluttered bathroom that’s easy to keep that way.